Anyway, have the ride carry a crop for the warmup, first 10 minutes, or whole lesson! I used it on 2 riders today and it really helped. I love your blog. Are there any books you could recommend to me as I must write my own therapeutic lessons plans for my program. My mentor instructor just has so much experience she can write them in her mind then just put them to paper. Open to any suggestions regarding staging the progession of lesson plans. Hi Noreen, thanks for writing! Unfortunately I don’t know of any good books, that’s why I started the blog, to share what I learn with others who have a hard time finding resources. Look on the index page for articles about writing lesson plans. The best book I’ve found is “Strategies for therapeutic riding instruction volumes I and II”. 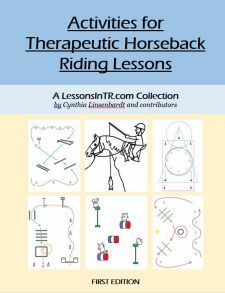 Even though it is a little outdated, it’s more about all aspects of therapeutic riding with not much on lesson planning, but really informative. Is there any article in particular you’d like to see on the blog? I’d love to write something that would help you out. Visting family in Ireland at the minute. Yes, copies of your last years best topics and the site for games. Thank you for your support. I had a young (9 yrs) rider with “subclinical” apraxia (not bad enough to merit OT or PT) whose hands would gradually float toward his ears at walk and trot. At the time he was riding independently at walk and trot in a semiprivate lesson. For a few lessons I incorporated a resistance band to help increase his awareness. 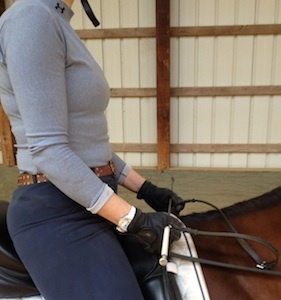 I threaded it through the d-rings on the English saddle and had him hold onto the ends with his reins. Nothing was tied. This way as his hands started to rise, he automatically got a gentle tug downward. 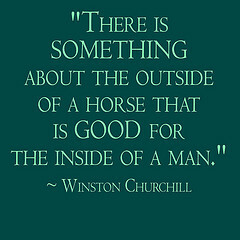 It made a huge difference at posting trot!